SALEM, Oregon, March 27, 2019 (ENS) – Oregon Governor Kate Brown, a Democrat, today signed a bill into law that creates a new line of defense against offshore oil and gas drilling that could undermine the coast’s thriving tourism, recreation and fishing industries. The bipartisan bill, sponsored by Senator Arnie Roblan and Representative David Gomberg, both Democrats, and Representative Brock Smith, a Republican, makes permanent a moratorium on oil and gas leasing in Oregon’s Territorial Sea that had been set to expire in 2020. The bill also blocks the development of new piers, pipelines and other infrastructure in state waters required to support oil, gas and sulfur drilling further offshore. “This legislation is the product of Oregonian voices speaking loudly for Oregonian values and taking a leadership role in preventing the erosion of core laws that protect our environment,” the governor said. Governor Brown was joined at the signing ceremony by lawmakers and advocates, including the bill’s chief co-sponsors. This legislation was a response to a federal proposal released last January to open 90 percent of U.S. waters – including the coasts of Oregon, Washington, and California – to new oil and gas leasing. 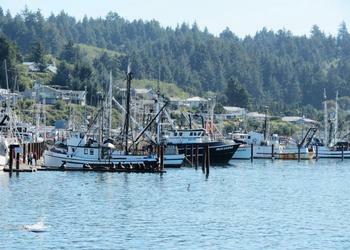 Oregonians submitted more than 30,000 comments on the federal plan, and several communities have passed resolutions opposing it, including the cities and ports of Newport and Toledo, and the cities of: Port Orford, Gold Beach, Lincoln City, Yachats and Portland as well as the Siletz Tribal Council. There has been a strong response from the business community, with more than 2,400 companies coming together to form the Business Alliance for Protecting the Pacific Coast. Northwest EcoTours, Pacific Ocean Harvesters, Local Ocean Seafood, Sleepy Monk Coffee Roasters, and Cleanline Surfshop are among its members. According to the National Ocean Economics Program, Oregon’s ocean economy is worth $2.5 billion annually and supports 33,000 jobs. More than 25,000 of those jobs are in tourism, recreation and fishing, the sectors that stand to lose the most from an oil spill. The Oregon Coast also provides essential habitat for diverse species of plants and animals that depend on its unique ecosystems. The new law builds upon Governor Brown’s October 25, 2018 executive order blocking oil drilling off Oregon’s coast. The executive order directs state agencies to protect Oregon’s coastal economy by preventing activities associated with offshore oil and gas drilling. 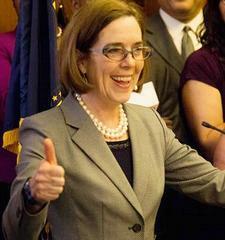 Governor Brown had sought an exemption for Oregon from the Trump Administration’s proposal for offshore drilling – similar to the exemption Florida received. But Oregon was not granted such an exemption. 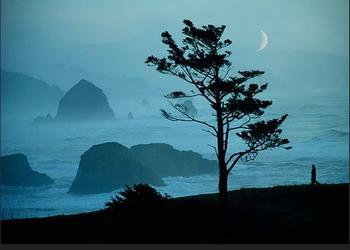 Oregon is one of several states that has taken action to protect its coastal economy from the threat of oil drilling. California passed similar legislation last year, and Washington is currently working on oil spill prevention legislation. Several Atlantic states and Hawaii also are working on drilling bans. The Bureau of Ocean Energy Management is expected to release its revised federal drilling proposal this month.